The Russian president promised to work for lifting bilateral ties and business, defence and technical cooperation. Russia is looking forward to working closely with the Narendra Modi government, President Vladimir Putin said in St Petersburg, according to PTI. Putin also promised to work for lifting bilateral ties and economic, military and technical cooperation. The Russian president added that he had already met Modi. “I am going to work with him closely,” Putin said. He called India an “outstanding civilisation,” while conveying his congratulations on the recent successful conduct of the general elections. In the report that was carried by the New Indian Express, Putin said Russia would make all arrangements for improving bilateral relations and economic, humanitarian, military and technical cooperation. “We have a lot of cooperation in many areas, historically and otherwise. The prospects of cooperation are high. We are doing everything to fulfil this,” Putin said, while thanking India for standing by Russia in the wake of the Ukraine crisis. India abstained from voting in the United Nations when Ukraine, backed by the US, tried to pass a resolution against Crimea joining Russia. Earlier India’s then-National Security Advisor said Russia had legitimate interests in the peninsula. India also refused to back Western sanctions imposed on Moscow after the Crimean reintegration and the subsequent trouble in the southern and eastern parts of Ukraine. Putin was cited as saying that the Indian leadership saw the Ukraine problem and considered all its components in historical perspective and with a deep analysis of Russia-India relations. “We are grateful to them for this,” PTI quoted Putin as saying. 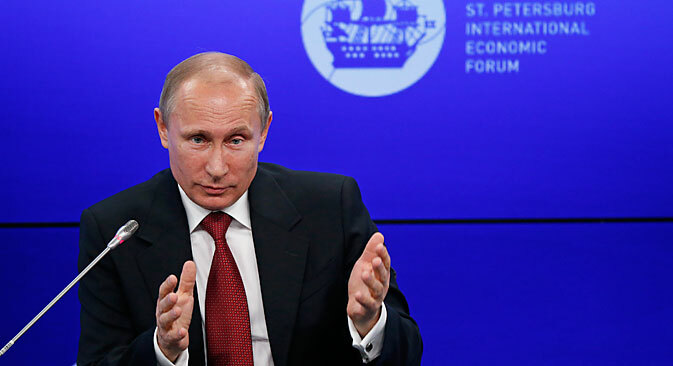 The Russian president also referred to remarks made by Indian participants in the St. Petersburg International Economic Forum and said trade potential has not been fully tapped.